This tender perennial from tropical South America makes a cluster of dark green ovate leaves at its base, from which square stems rise – to a height of over two metres. Pompoms of tiny fragrant ROSE-LAVENDER flowers appear atop these stems in mid-summer & last until first frosts. The entire plant, which may measure 3ft x 6ft, forms an airy screen through which neighbouring plants can still receive a share of sunshine. 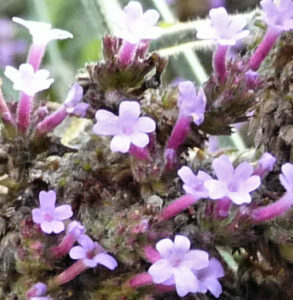 Verbena bonariensis likes full sun to part shade & will tolerate poor soil as long as it is well-drained. Even if the plant is felled by a cold winter, the many seeds it will have produced may well grow into new Purple Tops the following season. Will need staking. 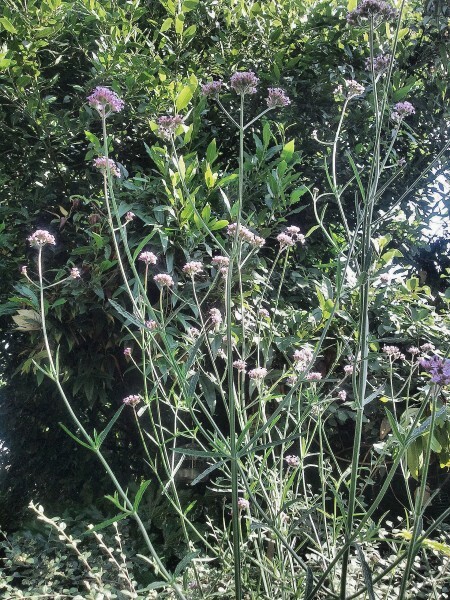 Slugs and snails are uninterested in Verbena bonariensis. Its rough stems deter any nibbling. But butterflies & bees flock to it for its nectar, clinging to the flower mounds as they blow in the breeze. While Purple Top grows well in nearby Gillespie Park as well as several Highbury front gardens, we have lost two plants to icy winter conditions in the back garden here. This contrasts with parts of the USA, where it may become invasive. Verbena Bonariensis 2014, below, survived winter planted in its sheltered half barrel. 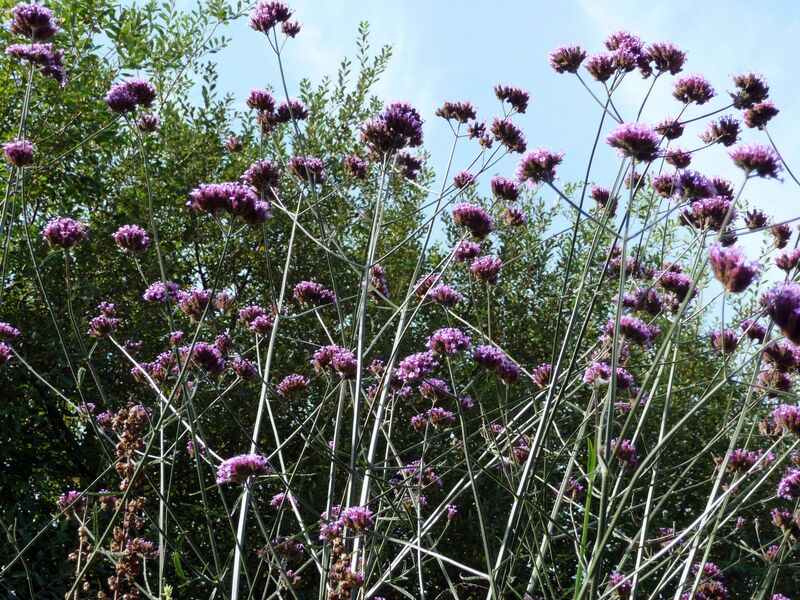 Christopher Lloyd planted Verbena Bonariensis in his garden at Great Dixter. He began the nursery in 1954, & it remains ‘small, personal & professional’. About 80% of Dixter’s nursery plants are raised from stock from their fabulous plantings. We got our 2013 Verbena Bonariensis there. If you hope to visit just one great garden in the southeast this year, why not make it Great Dixter? Verbena Bonariensis from Great Dixter nursery catalogue, 2018.